why does it seem like ages ago since we were in shots like this one? I'm going to go dig one up today :) HLT! 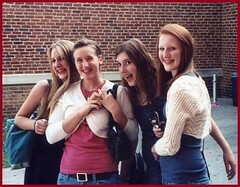 The essence of high school girlfriends is captured in this photo. Great job! HLT! What a great shot of friendship! high school friendship - so much fun. cute photo. Happy LT to you!